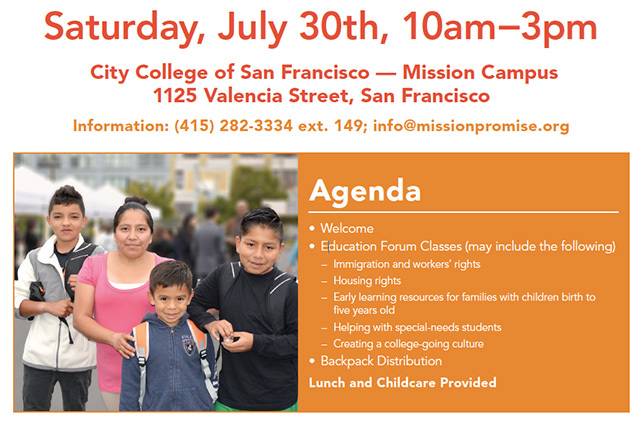 A group of organizations focused on supporting students at local schools and their families will host a series of presentations and a backpack giveaway at the Mission District branch of San Francisco City College this Saturday, July 30 from 10 a.m. to 3 p.m.. 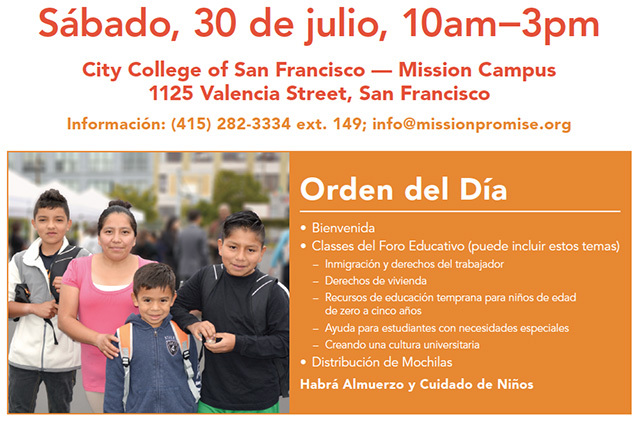 The Mission Promise Neighborhood is a citywide community partnership of schools, colleges, nonprofits and local leaders to support kids and families living, working and attending school in the Mission District to help youth graduate and families achieve financial stability. Topics to be covered include immigration and workers’ rights, housing rights, early learning resources for families with children up to five years old, and special needs students may have. Lunch and childcare will be provided for those who attend, and the presentations will be followed by a giveaway of free backpacks for the first 500 children to participate. CCSF’s Mission Campus is at 1125 Valencia Street. No pre-registration is required, but more information can be obtained at info@missionpromise.org.